Leyton Orient continued their 100% record to their League 2 campaign with a 2-0 home win over Bristol Rovers. A first half penalty from Lloyd James and a Jay Simpson strike on the stroke of half time sealed Orient’s fifth win out of five. James converted from the spot after Paul McCallum had been fouled by James Clarke before Man of the Match Simpson calmly slotted home just before half time. O’s manager Ian Hendon off the back of four straight wins in the league named an unchanged side for the fifth time in the league. However instead of the normal midfield diamond, Hendon opted for a flat midfield 4 with Cox moving to a wide left position and Pritchard on the right. New loan signing Joe Maguire was named on the bench after his loan move from Liverpool yesterday. Rovers boss Darrell Clarke made only 1 enforced change with Tyler Lyttle replacing the injured Daniel Leadbitter who was stretched off last week. The Pirates lined up in 3-5-2 formation with Lyttle and Lee Brown wing backs for the visitors. In a scrappy opening period, it was the visitors who settled down the better with the high wing backs of Lyttle and Brown creating problems for the O’s. Hendon’s decision to play Cox and Pritchard wider was to prevent Rovers coming out with the ball. Orient were struggling to get going as Rovers were frustrating their hosts. Rovers looked dangerous on the break and nearly took the lead after 9 minutes. Following an Orient corner, visiting captain Chris Lines broke past Lloyd James, he drove forward and played a through ball to Ellis Harrison. Harrison cut back onto his favored right foot but his low shot was palmed away for a corner by Alex Ciask. Easter was linking the play well for the visitors who sat fourth before kick off with three straight wins as they prevented Orient space. Rovers boss Clarke had seen that Orient like to pop up in pockets of space and receive the ball on the half turn but his side were squeezing the play creating mistakes. Orient did grow into the game after 15 minutes with a period of good possession, trying to be patient to create opportunities. Moore, Pricthard and Clohessy were linking up well in midfield but were still finding it hard to create any openings. The O’s did have a faint penalty appeal when Paul McCallum appeared to have his shirt pulled but referee Darren Drysdale waved away appeals. It was McCallum who was involved in the major talking point after 23 minutes when James Clarke apparently pushed the Orient forward over in the box. Drysdale pointed to the spot incensing the visiting players but Lloyd James stepped up and slotted home for his second of the season to put Orient ahead. The O’s had failed to create much going forward but needed second invitation to take the initiative in the contest. Rovers will feel harshly treated with the decision and if it was given against the Orient I would have been incensed myself. Hendon’s team had more impetus after the opener but the game still remained tightly poised at 1-0. With the home side enjoying more possession, they were continuing with the patient build up with Moore and Simpson having more of an impact. Cox went close 5 minutes before the break after McCallum laid off to Pritchard who in turn played Cox in but the winger saw his shot saved by Chapman in the Rovers goal. Rovers could have equalised before the break when Alex Ciask flapped at a Chris Lines’s corner but Mathieu Baudry blocked Tom Lockyer’s goal bound shot. However Orient who have been known in the opening games of the season for their high pressing struck seconds before the half time whistle. Pressure from McCallum and Pritchard saw Chapman clear to Lyttle in the right back position. The wing back was put under pressure from both Cox and Fraser Shaw; Cox nicked the ball and picked out Simpson with a diagonal ball. Simpson took the ball down, shaped onto his left then his right and calmly slotted home at the near post to give Orient a 2 goal cushion at the break. Hendon was forced to make a change at the break with Matheiu Baudry picking up injury and replaced by Alan Dunne. Rovers boss Clarke changed his formation and personnel at the break with Jeffrey Monakana and Cristian Montano replacing Tyler Lyttle and Ollie Clarke. 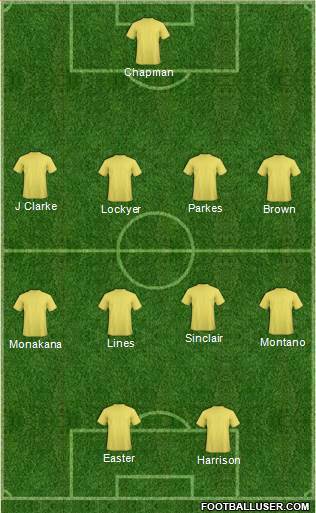 The Rovers boss reverted to a 4-4-2 system with Monakana and Montano operating on either wing. Despite the formation change from the visitors, it was the O’s who could have added a third quickly after the break. First Lloyd James picked out Simpson with a reverse ball over the Rovers defense, but the front man could not lift his shot over the head of Aaron Chapman. Simpson then tested Chapman from distance but his shot was again saved. Pricthard was next to Chapman from distance but the Rovers keeper was more than a match for his effort. Rovers then pushed to see if they could get back in the game with Orient dropping to a 4-5-1 formation with Jay Simpson moving to a right wing position. It was the striker who brilliantly blocked Lee Brown as the left back looked set to strike on goal. Simpson who had netted the second, epitomized the ethos created from Hendon and his backroom staff with his unselfish running for the team to keep the lead in tact. Ciask who looked shaky earlier on made two quick saves in succession with him palming away Jermaine Easter’s effort away before blocking Ellis Harrison’s effort. The O’s had weathered the Rovers storm but the away side really should have halved the deficit with 20 minutes left. Lee Brown inswinging free kick was glanced just past the far post by Tom Parkes. Any more on the header and it would have nestled into the bottom corner. Clarke threw on Matty Taylor for Jermaine Easter but Rovers still could not grab a goal. Hendon took of man of the match Jay Simpson for Ollie Palmer and Blair Turgott replaced Bradley Pritchard. James Clarke should have compensated for his mistake for the penalty but he somehow volleyed over from a corner. Orient could have added a third but Blair Turgott failed to play in Ollie Palmer in the dying minutes. The O’s registered their fifth win of the league season and their third clean sheet in three games at home. Ian Hendon spoke to leytonorient.com post match stating that “it was a good team performance, the victory was right for us, it was a tough game but full blooded”. Hendon’s team march on at the top of the table and Rovers did create problem sfor the hosts but the quality which his side possesses ultimately proved the difference. The penalty decision was a key turning point in the game with Orient failing to create opportunities before the penalty. The decision was harsh and McCallum made the most of it but the referee in truth was terrible for both sides and at times unwilling to let the game flow. Once Orient began to string passes together they created openings and it appears that when one striker has a quiet afternoon the other one strikes. This time it was Simpson who seems to be loving life in E10 currently, with a place in the starting line up and the composure to score at this level he is a real threat in every game. However it is not just the quality that Orient possess, the togetherness and work rate which Hendon urges is brilliant. Make no mistake the quality of Simpson’s play for his goal was excellent but it was only created from closing down by McCallum, Cox and Shaw. 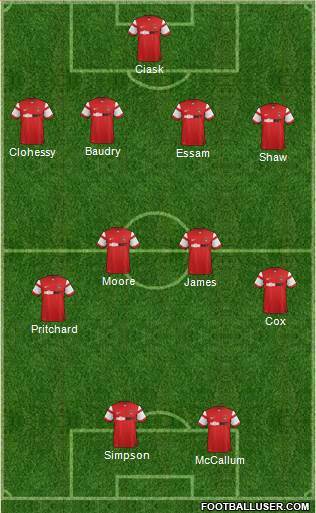 The “Moore” I see Pritchard and Moore together, I think that they are really underrated players. Moore had is best game in an O’s shirt and before the season Lloyd James would have been the first name on the team sheet in the middle of midfield but at the moment on evidence James could be the one to be withdrawn or miss out. Although Moore and Pritchard may not have the ability for a defense splitting pass, their ability to win the ball back, work rate and energy makes up for it. The combinations created between them creates space for the likes of Cox, Simpson and McCallum to create chances. Hendon’s side travel to Luton in midweek for the JPT first round with the O’s boss looking set to name a youthful side giving Kashket, Ling and Moncur some game time and experience. Despite five wins from five, Hendon appears to me to still find improvement in his side, Orient were not at full steam today and as said on twitter “God help the team play that Orient play when everybody clicks”.